Ashley Daugherty is a senior majoring in Anthropology and Spanish. She is looking to work in Applied Business Anthropology. The following was written for REL 360: Popular Culture/Public Humanities. Elmer Gantry is a film that exposes hypocrisy and greed among religious leaders who seek to exploit gullible citizens looking for something in which to believe. This abridged version of Sinclair Lewis’s novel of the same name focuses on Elmer Gantry, a con man expelled from seminary school, and Sister Sharon Falconer, a character loosely based on evangelist Aimee Semple McPherson. Religion is an aspect of culture that permeates all societies, and much of history is defined by religions in power at the time. Gaining and keeping followers is the key to the success of any religion, and religious leaders must recognize this and figuratively, though sometimes literally, sell the religion. Modern, yet extreme examples of this include ISIS, a violent terrorist organization that is somehow able to recruit privileged teens from Western countries, and the Peoples Temple of the Disciples of Christ, which used liberal ideology to attract minorities and young people. More mundane examples include the star power of Scientology and Christian rock concerts. Since religions are often sold with a spin to attract the most people or a certain group of people, it is important that potential followers examine the reasoning and intentions of religious leaders. 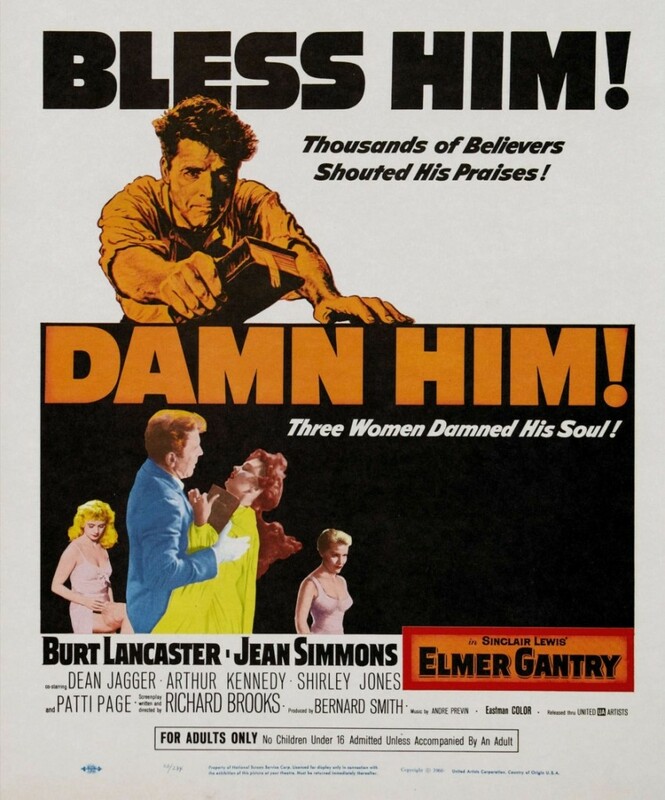 Elmer Gantry sets out to do just that in the world of evangelical revivalists, and an examination of the complicated relationship between the congregations and the religious leaders of the film may help illuminate the popularity of many religious movements, even those that appear to be a farce from the outside. 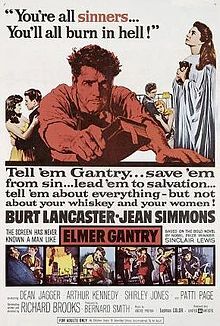 Elmer Gantry and Sister Sharon Falconer, the two main religious leaders of the film, are portrayed as morally dubious though Gantry has a small redemption and Falconer clearly truly believes in her cause. Gantry’s beliefs are left ambiguous, as are his motives for evangelizing. Gantry is portrayed as a smooth talking but frustrated salesman, struggling to make a living. He wears fine clothes, yet he rides the railways like a vagabond. His dissatisfaction with his life, as well as his drinking, lying, and philandering give the audience a portrait of an unsavory man. The inspiration for Falconer, Aimee Semple McPherson, on the other hand, was thought of as a celebrity, and many felt her intentions were dubious. There are glimmers of this in Sister Sharon Falconer, like when she admits that she knows Gantry is lying but allows him to continue preaching because she believes it is for the greater good. In another scene, Falconer exhibits pride and materialism when she admits that she always wanted her own church with a giant glowing cross. Still, Falconer dies for her beliefs and is shown to fervently believe in God; she clearly wants to save people. With the characterization and strong personalities of these two characters, it is easy to assume a one-sided relationship between Gantry and Falconer and their congregants, but this is not the case. As with any service, the revivals in Elmer Gantry would not be put on if the pastors and congregations of these areas did not have a demand for them. In the film, Gantry happens upon one of Falconer’s revivals being held in a country town. The tents are filled with people clamoring to see Sister Sharon Falconer. During the service one man begins speaking in tongues. In another service a couple comes forward to ask that Falconer cure the husband’s deafness. The film leaves the realities of these mystical happenings up to interpretation, and so gives the congregants active, if small, roles in the narrative. Falconer gives of herself throughout the film to help her congregants, often going outside her comfort zone to preach to angry crowds and secure the donations she sees as a necessary evil for the continuance of her sermons. When Gantry is framed as a philanderer, both Falconer and Gantry endure the wrath of an angry public in Zenith, but are quickly restored to their pedestals upon a retraction. It is clear that the revivals rely on the approval and demand of the public and that the revivals certainly could not survive without the support of a large number of congregants; however, there are several points in the film in which it appears the congregants are being taken advantage of by town and religious leaders. In a scene where Gantry and Falconer are hoping to get funding to set up their revival in the city of Zenith, lack of attendance is straightforwardly given as the reason for seeking out the revival. Lewis’s famed businessman character, George Babbitt, and pastors in the community discuss the merits of holding a revival in Zenith. Despite their reservations about the dignity of revival-style preaching, many of the pastors agree that it would be best for their congregations to get excited about Christianity again in hopes that this would subsequently bolster attendance. The merit of this argument is undermined because it is given by Babbitt, not out of caring for the citizens of Zenith, but rather because he stands to gain the most financially from the revival. Additionally, this positive representation of the necessity of revivals to faltering churches is soured by the probability that Falconer’s revivals take advantage of the lower class. Before Falconer and Gantry set up their revival in Zenith, a large city which is described as a place where Falconer and Gantry can become famous, Falconer’s revivals were held in the country and in small towns. Many of the people attending the revivals would then be working-class individuals. One of the first scenes with Sister Sharon Falconer involves her asking for donations from these people. The attendants give her their money, she leaves after a short period of time, and then the attendants are no better off and short on money. One attendant of the revivals even describes himself as only being a good Christian when a revival is in town, and then going back to his old ways once it is gone. There is a definite give and take between Gantry and Falconer and the congregants in Elmer Gantry. The public has the power to end the careers of Falconer and Gantry; however, Gantry and Falconer sell the revivals, and eventually Falconer’s church, in a way that pleases the public. By so doing they give themselves an advantage over the general public. Elmer Gantry is a nuanced look at the world of evangelists and revivals. The portrayal of revivals as a necessary service with a precarious balance between helping and hurting both the revival’s leaders and attendants is masterful. Though it makes its position on for-profit religious functions clear from the very beginning of the film, it attempts its critique in a fair manner. Elmer Gantry shows the necessity and sincerity involved in these functions, as well as the dangers of falling into the trap of hypocrisy and greed, through its highly humanized leads, Elmer Gantry and Sister Sharon Falconer. Sarah Griswold is a senior double majoring in Mathematics and Religious Studies. She spends her “free time” analyzing her favorite shows on Netflix, which of course winds up ruining them. The following was written for REL 360: Popular Culture/Public Humanities. “Elmer Gantry was drunk,” begins Sinclair Lewis’s 1927 novel. That’s how the movie Elmer Gantry begins too. The story is of Elmer Gantry who loves women and whiskey more than just about anything else. A fast-talking salesman, Gantry has an incredibly charismatic personality that convinces people to give him money for anything from helping out a nun to selling vacuum cleaners. After being drawn to Sister Sharon Falconer’s travelling revival tent, he finds himself immediately attracted to her and finds a way to convince her to allow him to join her in the show. The story goes on to follow Gantry and Falconer as the travel around the country selling their religion to any and everyone who will listen. Watching the film, you are immersed in two and a half hours of 1960s humor and absurdity beyond the absurdity of the story itself. The protagonist Gantry is quite the character. Fast-talking and clearly extroverted, Gantry seems to be able to weasel his way into just about anything he wants. However, one of the many questions we are left with at the end of the film is whether Gantry ever actually knows what he wants. He seems to change throughout the film to become more genuine in his actions. While definitely interesting and meriting further discussion, I’d like to turn my focus to something else entirely. What I truly found fascinating about the film was the race politics. During the 1960s, overt racism was widespread and generally considered to be normal. While the film didn’t contain plot lines that were overtly racist, there were two particular images that stood out to me as indicative of the way the film’s director and producers imagined the world. The first image that stood out to me was this scene in which Gantry wanders into a black church. During the scene, the congregation sings a gospel hymn when Gantry comes in. As they begin to realize that an outsider – a white man – is among them, they stop singing one by one and turn to stare. As the music dies, Gantry picks up where they left off and continues the hymn. The congregation slowly begins to join back in and Gantry begins to solo with the congregation acting as back up singers. The scene ends with the end of the hymn and a young girl who is still staring at Gantry. The solo serves the purpose of highlighting Gantry’s comprehensive familiarity with various types of hymns and church settings. But I cannot help but to think that the choice to include the solo carries an undertone of stereotypical 1960s racism. The young girl’s continued suspicion of Gantry coupled with the setting reflects an attitude (likely from the director and/or producers) of essential difference between black and white. To reinforce my suspicions, a comparable image appears towards the end of the film. The other image that stood out to me was during the scene toward the end of the film when Sister Sharon’s church is burning down. Outside of the church is a large cross that is adorned with light bulbs. While brief, there is a shot of that cross going up in flames. In context and like the scene in the black church, it makes perfect sense for this cross to burn with the rest of the church. However, considering the context of the 1960s and the oppressive presence of the Ku Klux Klan at the time, it is near impossible to separate the image from association with the KKK. The image of a burning cross was (and arguably remains) a threat in and of itself. So while the image put into context makes perfect sense and the image carries no further explanation in the film, it is not devoid of the meaning associated in this particular way. Between this shot and the scene from the beginning of the film, Elmer Gantry carries undertones indicative of 1960s racism. The film lacks any African Americans beyond the scene discussed earlier. This further highlights the racist undertones of the 1960s. Of course, these are only a couple of tiny pieces of the two and a half hour-long film, which as far as I could tell said nothing more about race. Instead, the film in its entirety produces an interesting exploration of revivalism and outrageous personalities, while providing intriguing entertainment. So one could read into these two particular aspects of the film as I have done, or one could choose to ignore them entirely and enjoy the film. Or just dissect a different part entirely.